I’m not even sure where to begin with this Russian film from the Volga region. It’s certainly not like anything else I’ve seen from Russia up to this point, or from anywhere else, for that matter, although there are echoes of “Twilight of a Woman’s Soul,” perhaps, but in a more flamboyantly sensationalistic manner. The story begins prosaically enough: the young daughter of a prominent merchant is in love with a young man below her station. One day Papa comes home and announces that he has found a good husband for her – one who looks pretty much just like him, in age and demeanor. She, and the mother, are horrified, but powerless to do anything about it. When she brings the young man over to break the news, Papa returns home unexpectedly, and in trying to hide him in her room, she accidentally kills him! Now the whole family is caught in a downward spiral of shame, cover-ups, and blackmail. The girl has to prostitute herself, until, at the end, she takes revenge on the men who have exploited her in a most violent manner. To make this strange film even stranger, the liner notes claim that it was shot with the intention of blackmailing a real family named Bashkirov which had undergone a similar scandal. That’s all the more bizarre, considering the punishment meted out to the on-screen blackmailers, but it’s certainly possible. 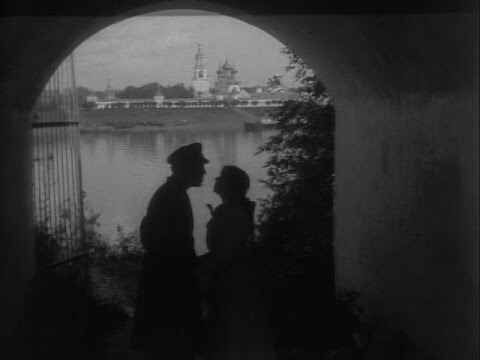 When the movie was released in Russia, apparently, the name was changed, “because the heroine’s surname is identical to that of some well-known merchants in a certain town on the Volga — by sheer coincidence of course.” But surely the details of the story were similar enough to the real-world scandal that all news-sensitive viewers must have known about it. Gentlemen, I’m afraid your beards must wait outside. Technically, this film is about equal to movies made in the USA at the time, but not comparable to the work of Evgeni Bauer. There are close-ups to emphasize emotion, the camera pans (at one point passing through a false wall from one room into another) and there are some interesting compositions and one good use of a silhouette, but on the whole it’s your standard staged performance. The plot is easy enough to follow, although apparently there is missing footage, and one lengthy scene where the father talks to a man in uniform is difficult to interpret. The other thing I wanted to mention is the extreme facial hair on pretty much every male in the movie except for the young victim. Now, most of the Russian movies I’ve seen so far have featured beards (in fact, “The Brigand Brothers” used the length of the brothers’ beards as a narrative device to let you know where in the flashback a given scene fit), but this is a whole new level of beardedness. The beards in this movie at times threaten to take over the screen, leaving no room for the actors. This is definitely a movie for facial hair aficionados.